"Stay evil, doll-face." That's an awful quote from Will Smith in Suicide Squad, a deeply flawed superhero film that manages to be DC's worst film of 2016. Smith portrays Floyd Lawson, AKA Deadshot, a hitman who is an excellent marksman, who is selected by intelligence operative Amanda Waller (played by Viola Davis) & Army Col. Rick Flag (played by Joel Kinnaman) to be part of Task Force X, a group of imprisoned dangerous criminals to be used in high-risk missions for our government. Joining him are: Dr. Harley Quinn, AKA Harley Quinn (played by Margot Robbie), a former psychiatrist turned bad by her lover, The Joker (played by Jared Leto); Chato Santana, AKA El Diablo (played by Jay Hernandez), a former L.A. gang member who can shoot fire; George "Digger" Harkness, AKA Captain Boomerang (played by Jai Courtney), an Australian thief noted for his deadly boomerangs; Waylon Jones, AKA Killer Croc (played by Adewale Akinnuoye-Agbaje), a villain with reptilian features; & Christopher Weiss, AKA Slipknot (played by Adam Beach), a mercenary known for his excellent grappling & scaling. Also joining them are: Col. Flag's girlfriend, Dr. June Moone, AKA Enchantress (played by Cara Delevingne), an archaeologist possessed by an ancient evil force that turns her into a great sorceress; & Tatsu Yamashiro, AKA Katana (played by Karen Fukuhara), a Japanese martial arts master. All of them, save for Flag, Moone & Yamashiro, have micro-bombs implanted in their necks, set to go off if they abandon the team. Eventually, Enchantress takes over complete control of Moone, & goes on a rampage, & it is up to the team to stop her. 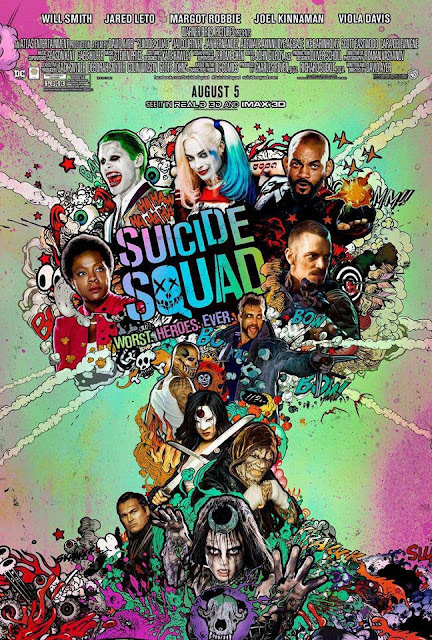 The cast is a mixed bag; Smith & Robbie are great, while Leto is awful. The direction & screenplay from David Ayer are both mediocre. And the visual effects are terrible. Although it does have its moments, it somehow manages to be worse than the already awful Batman v. Superman: Dawn of Justice.